New Dupont SPE Hydrogen Water Generator for 2019! New!!! The ACCWATER SPE technology hydrogen Rich Water Generator Bottle is the new revolution of hydrogen water bottle in the market. The hydrogen water generator bottle makes the water in a high hydrogen concentration from 1400ppb-3000ppb,ORP from -300mv to -600mv.Most Important,with its high quality of DUPONT N117 membrane,it puts only pure H2 into the water. Oxygen, Ozone and Chlorine are separated out. So the hydrogen water you get is 99.99% pure H2 and NO Chlorine,No Oxygen,No H2O2,NO Ozone. Able to attach disposable plastic drinking water bottles,portable for travel,work and office. Any kind of water can be used:Mineral Water,Pure Water,and Distilled Water is welcomed. 1.Puts only pure H2 into the water. Oxygen, Ozone and Chlorine are separated out. 2.Any kind of water can be used. 3.Generates much higher concentration of hydrogen water than standard electrolysis bottles. 4.Our hydrogen rich bottle will create more H2 within 5 minutes than most bottles on the market. 2.One touch operation, smart and easy to use. 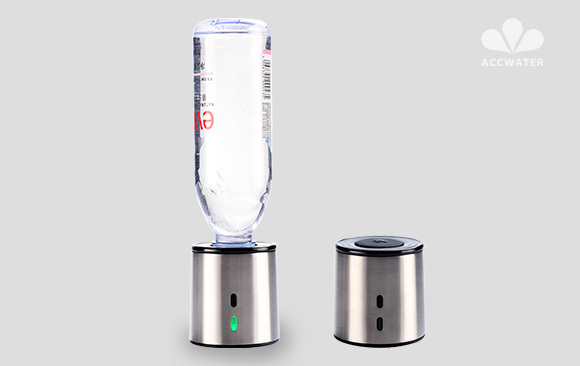 3.Quickly produces hydrogen rich water within 5 minutes, and can be drunk directly from bottle. 4.Portable for travel, work and office. 7. Well-sealed for no water leakage.